Ryukyukoku Matsuri Daiko, a Japanese drum troupe, and the Hula Girls perform in Troy. They will appear at Ohio Living Dorothy Love, Sat., Jan. 26, in a free performance. 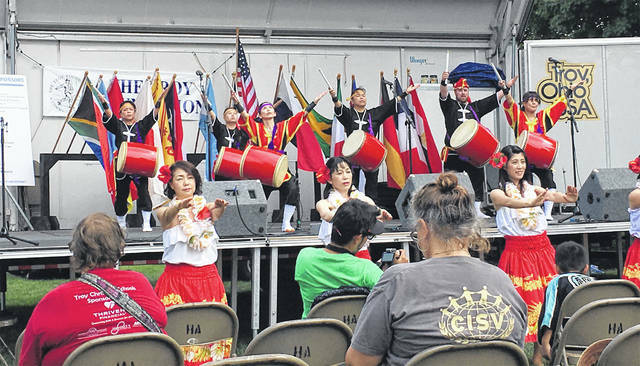 SIDNEY — Ryukyukoku Matsuri Daiko will perform in a free drum concert, Saturday, Jan. 26, at 2 p.m., in the Amos Community Center on the campus of Ohio Living Dorothy Love, 3003 Cisco Road. The drum group is made up predominantly of musicians from Okinawa, now living in Dayton and Cincinnati. The group name can be translated as Ryu-kyu (the former name of Okinawa) Matsuri (festival) daiko (drum). Ryukyukoku Matsuri Daiko literally translates to Ryukyu Kingdom Festival Drums. Ryukyu Kingdom is the ancient name of what is presently known as Okinawa prefecture of Japan. The performers dance and drum simultaneously to an exciting blend of traditional and contemporary Okinawan music. It is also a dynamic blend of traditional dance moves and karate forms. The original group was established in 1982. There are 47 chapters in Japan and 28 chapters in six countries with a total of more than 2,500 members. The Ohio chapter was established in 2013. There are 11 adult members and three junior members. The troupe performs at various cultural events and enjoys sharing Okinawan culture. They have performed at Troy Strawberry Festival. The Dorothy Love concert is open to the public and may be loud. Attendees may want to take ear plugs. https://www.sidneydailynews.com/wp-content/uploads/sites/47/2019/01/web1_Drummers.jpgRyukyukoku Matsuri Daiko, a Japanese drum troupe, and the Hula Girls perform in Troy. They will appear at Ohio Living Dorothy Love, Sat., Jan. 26, in a free performance.